For the 1956 documentary film, see The Dark Wave. Dark wave is a music genre that emerged from the new wave and post-punk movement of the late 1970s. Dark wave compositions are largely based on minor key tonality and introspective lyrics, and have been perceived as being dark, romantic, and bleak, with an undertone of sorrow. Common features include the use of chordophones such as electric and acoustic guitar, violin, and piano, as well as electronic instruments such as synthesizer, sampler, and drum machine. The genre embraces a range of styles including cold wave, ethereal wave, gothic rock, neoclassical dark wave, and neofolk. Since the 1980s, the term has been used in Europe to describe the gloomy and melancholy variant of new wave and post-punk music. At that time, the term "goth" was inseparably connected with gothic rock, whereas "dark wave" acquired a broader meaning, including music artists that were associated with gothic rock and synthesizer-based new wave music, such as Bauhaus, Joy Division, The Cure, Siouxsie and the Banshees, The Sisters of Mercy, Anne Clark, Depeche Mode, Gary Numan, and The Chameleons. The term darkwave originated in the 1980s as an indicator of the dark counterpart of new wave. Bands such as Cocteau Twins, Soft Cell, and Depeche Mode are exponents of this first generation of darkwave. Darkwave ... employs relatively slower tempos, lower pitches, and more minor keys in its musical settings of melancholy texts than new wave. The movement spread internationally, developing such strands as ethereal wave, with bands such as Cocteau Twins, and neoclassical dark wave, initiated by the music of Dead Can Dance and In the Nursery. French cold wave groups such as Clair Obscur and Opera Multi Steel have also been associated with the dark wave scene; Rémy Lozowski, guitarist of French cold wave band Excès Nocturne, described his music as new wave noire ('dark new wave'). Simultaneously, different substyles associated with the new wave and dark wave movements started to merge and influence each other, e.g. synth-wave (a kind of new wave with synthesizers, also referred to as "electro-wave") with gothic rock, or began to borrow elements of post-industrial music. Attrition, Die Form (France), Pink Industry (UK), Psyche (Canada), Kirlian Camera (Italy), and Clan of Xymox (Netherlands) performed this music in the 1980s. Other bands such as Malaria!, and The Vyllies added elements of chanson and cabaret music. This sort of dark wave music became known as cabaret noir (or dark cabaret, a term popularized by U.S. dark wave label Projekt Records). German dark wave bands were partially associated with the Neue Deutsche Welle (i.e. German new wave), and included Xmal Deutschland, Mask For, Asmodi Bizarr, II. Invasion, Unlimited Systems, Moloko †, Maerchenbraut, Cyan Revue, Leningrad Sandwich, Stimmen der Stille, Belfegore, and Pink Turns Blue. 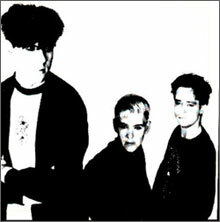 After the new wave and post-punk movements faded in the mid-1980s, dark wave was renewed as an underground movement by German bands such as Girls Under Glass, Deine Lakaien, Love Like Blood, Love Is Colder Than Death, Diary of Dreams, The Eternal Afflict, and Wolfsheim, as well as Project Pitchfork and its offshoot Aurora Sutra. Ataraxia and The Frozen Autumn from Italy, and the French Corpus Delicti also evolved from this movement and became the leading artists of the west Romanesque scene. All of these bands followed a path based on the new wave and post-punk music of the 1980s. In the 1990s, a second generation of darkwave bands became popular, including Diary of Dreams, Deine Lakaien, and The Frozen Autumn... The German band Deine Lakaien ... is audibly influenced by the dark synthesizer sounds of Depeche Mode. At the same time, a number of German artists, including Das Ich, Goethes Erben, Relatives Menschsein, and Endraum, developed a more theatrical style, interspersed with German poetic, metaphorical lyrics, called Neue Deutsche Todeskunst (literally New German Death Art). Other bands, such as Silke Bischoff, In My Rosary, Engelsstaub, and Impressions of Winter combined synthesizers with elements of neofolk and neoclassical dark wave. After 1993, in the United States the term dark wave (as the one-word variant 'darkwave') became associated with the Projekt Records label, because it was adopted by label founder Sam Rosenthal after leafing through the pages of German music magazines such as Zillo, and has been used to promote and market artists from German label Hyperium Records in the U.S., e.g. Chandeen and Love Is Colder Than Death. I first became aware of the term "Dark Wave" back in 1992. It appeared in German magazines – such as Zillo – describing a style of European music that followed other "waves" such as New Wave ... I found those two words ("dark" and "wave") quite interesting. This was something underground, submerged, obscure... which swept over you, immersed you, surrounded you. It was a poetic phrase that could describe many different sounds. At the time, I was looking for a name for my little mail-order company. I wanted something that would encompass the variety of music available in my catalog. Projekt features bands such as Lycia, Black Tape for a Blue Girl, and Love Spirals Downwards, some of these characterized by atmospheric guitar and synth-sounds and female vocals. This style took cues from 1980s bands like Cocteau Twins and is often referred to as ethereal dark wave. Projekt has also had a long association with Attrition, who appeared on the label's earliest compilations. Another American record label in this vein was Tess Records, which featured This Ascension, Faith and the Muse, and the reunited Clan of Xymox. an expansion of the rather limited gothic repertoire into electronica and, in a way, the US answer to the 'ethereal' subgenre that developed in Europe (e.g. Dead Can Dance). Anchored by Sam Rosenthal's now New York-based label Projekt, dark wave music is less rock and more roll, supporting bands who tend to emphasize folk songcraft, hushed vocals, ambient experimentation, and synthesized sounds [...] Projekt bands like Love Spirals Downwards and Lycia are the most popular of this subgenre. ^ a b Steinberg, Shirley R.; Parmar, Priya; Richard, Birgit (2005). Contemporary Youth Culture. An International Encyclopedia. Volume II. Greenwood Publishing Group. p. 431. ISBN 0-313-33729-2. "The subculture of the Goths (in Germany called "Grufties") started in Britain in the early 1980s and derives from the gloomy, resigned side of punk and new wave, in the field of music called "dark wave" or "doom."" ^ a b Ogiba, Jeff (11 July 2012). "A Brief History of Musical Waves from NEW to NEXT". Vice. "Dark Wave was another late-'70s off-shoot of New Wave. The genre contained the gloomiest of the groups, featuring with slower tempos, deeper vocals, and intense lyrical content. Some bands include The Danse Society, The Sisters of Mercy, and Bauhaus. The Dark Wavers still exist, and the popularity of the genre has seen a revival in recent years." ^ a b c Farin, Klaus; Neubauer, Hendrik (2001). Artificial Tribes: Jugendliche Stammeskulturen in Deutschland (Orig.-Ausg. ed.). Bad Tölz: Tilsner. p. 139. ISBN 3-933773-11-3. OCLC 493304020. ^ a b c Hecken, Thomas; Kleiner, Marcus S. (2017). Handbuch Popkultur. J. B. Metzler Verlag. p. 79. ISBN 978-3-476-02677-4. "Textlich und musikalisch ergibt sich für Dark Wave ein Stimmungsbild, das sich gezähmt zwischen Härte und Romantik bewegt, sehnsuchtsvoll und melancholisch, Wut kommt kaum aggressiv zum Ausdruck, alles wirkt ausgewogen und reflektiert." ^ a b Schilz, Andrea: Flyer der Schwarzen Szene Deutschlands: Visualisierungen, Strukturen, Mentalitäten. Waxmann Verlag, 2010, ISBN 978-3-8309-2097-7, p. 84. "Dark Wave ist ein ... Oberbegriff für düstere Spielarten des Wave, der auch Gothic darunter subsumiert. Cold Wave bezeichnet eine Untergattung experimenteller, minimalistischer Elektronikmusik aus Frankreich." ^ Reesman, Bryan (April 1999). "The Scene Is Now: Dark Wave". CMJ New Music Monthly (68): 48. Female vocals, both wispy and operatic, have become fashionable, particularly in the Ethereal subgenre . "Die Dark-Wave-Szene unterteilt sich unter anderem in den klassischen Dark Wave, den Gothic-Rock, elektronische Gruppen oder auch den Neofolk. "Genre der Dark-Wave-Musik, das durch verschiedene Stilmittel und Komponisten der Romantik, der Alten Musik oder der Neuen Musik inspiriert ist." ^ a b c d e f Farin, Klaus; Wallraff, Kirsten; Archiv der Jugendkulturen e.V., Berlin (1999). Die Gothics : Interviews, Fotografien (Orig.-Ausg. ed.). Bad Tölz: Tilsner. ISBN 9783933773098. ^ Matzke, Peter; Seeliger, Tobias (2002). Die schwarze Musik-Szene in Deutschland (2., erg. Aufl. ed.). Berlin: Schwarzkopf & Schwarzkopf. p. 217. ISBN 3-89602-332-2. OCLC 742385153. "Die Dark Waver, Waver – oder belächelnd auch "Grufties" genannt – sind eine Jugendkultur, die in den 80er Jahren aus der Punk-Bewegung entstanden ist." ^ Schmidt, Axel; Neumann-Braun, Klaus: Die Welt der Gothics. Spielräume düster konnotierter Transzendenz., Wiesbaden: VS Verlag für Sozialwissenschaften 2004, ISBN 3-531-14353-0, p. 261. ^ a b c d Rouner, Jeff (20 January 2011). "The Seven Ages of Goth". Houston Press. "The term "darkwave" came from back in the 1980s, and was one of the terms used to describe the Golden Age bands, as well as dark electronica acts like Gary Numan and Depeche Mode." ^ Peter Jandreus, The Encyclopedia of Swedish Punk 1977–1987, Stockholm: Premium Publishing, 2008, p. 11. ^ a b Farin, Klaus; Weidenkaff, Ingo (1999). Jugendkulturen in Thüringen (Orig.-Ausg. ed.). Bad Tölz: Tilsner. p. 41. ISBN 3-933773-25-3. OCLC 651857996. ^ "Composing noises". Sorted magAZine. 1999. "A pioneer of Darkwave music, the mix of Synth Wave, Post-Punk, and Gothic Rock had its golden age in the '80s among contemporaries like Bauhaus, Joy Division, The Cure, Sisters of Mercy, Siouxsie and the Banshees, Cocteau Twins, and Depeche Mode." ^ a b c d Kilpatrick, Nancy. The Goth Bible: A Compendium for the Darkly Inclined. New York: St. Martin's Griffin, 2004, ISBN 0-312-30696-2, pp. 84/85. "Der Trend ist eindeutig: Die großen Star-Bands verschwinden immer mehr aus dem Rampenlicht, während eine Vielzahl junger Nachwuchsbands sich stetig wachsenden Interesses seitens des Szene-Publikums erfreut. Und ohne unangenehmes Gefühl darf gesagt werden, dass Deutschland momentan das absolute Zentrum der Wave-Musik ist." ^ "Deine Lakaien – "From new wave followers to dark wave icons" – interview at SIDE-LINE". Side-line.com. 7 July 2005. Retrieved 2014-03-08. ^ Schmidt, Axel; Neumann-Braun, Klaus: Die Welt der Gothics. Spielräume düster konnotierter Transzendenz., Wiesbaden: VS Verlag für Sozialwissenschaften 2004, ISBN 3-531-14353-0, pp. 280/281. ^ a b Kilpatrick, Nancy. The Goth Bible: A Compendium for the Darkly Inclined. New York: St. Martin's Griffin, 2004, ISBN 0-312-30696-2, p. 90. Farin, Klaus; Wallraff, Kirsten: Die Gothics. Bad Tölz: Verlag Thomas Tilsner, 1999, ISBN 9783933773098. Mercer, Mick. Hex Files: The Goth Bible. New York: The Overlook Press, 1997, ISBN 0-879-51783-2. Steinberg, Shirley; Parmar, Priya; Richard, Birgit: Contemporary Youth Culture. An International Encyclopedia. Volume II., Greenwood Publishing Group, 2005, ISBN 0-313-33729-2.
van Elferen, Isabella; Weinstock, Jeffrey Andrew: Goth Music: From Sound to Subculture. Routledge Studies in Popular Music, 2015, ISBN 0-415-72004-4. Hecken, Thomas; Kleiner, Marcus: Handbuch Popkultur, J. B. Metzler Verlag, 2017, ISBN 978-3-476-02677-4.